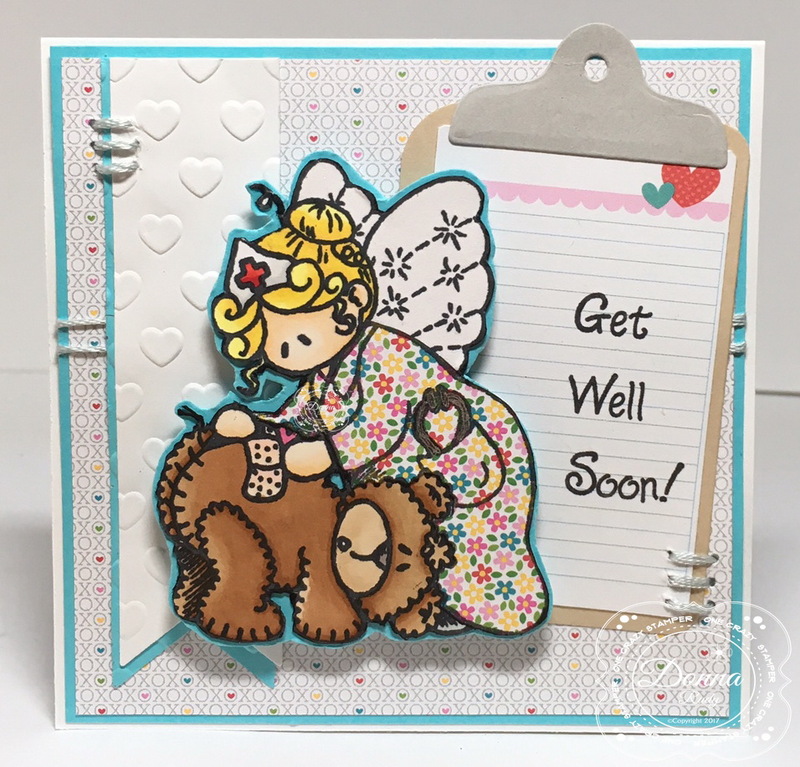 Kards By Krash Scrapper: Get Well Soon! This month the One Crazy Stamper design team will be using a variety of High Hopes Rubber Stamps to go along with our Anything Goes Challenge theme. I was going through my card stash and realized I don't have very many Get Well Soon cards. 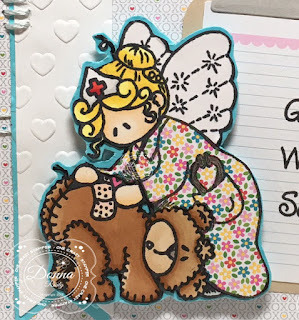 It is always when we are least expecting it that we need this type of card so I decided to use super cute "Valerie Nurse Angel" to create a card for just this reason. 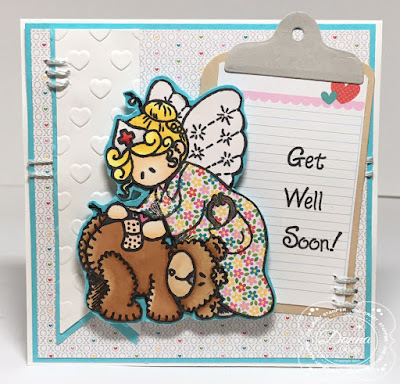 This 4x4 size card will go perfectly with a get well gift and was inspired by a crafty friend of mine who's name starts with "C". After colouring my stamp with alcohol markers, I cut fussy it out using my trusty manicure scissors. Now, I have noticed that some nurses are wearing print scrub tops to work so I decided to paper piece Valerie's nurse coat to add some fun. I also added sparkle to her wings using a clear sparkle pen. 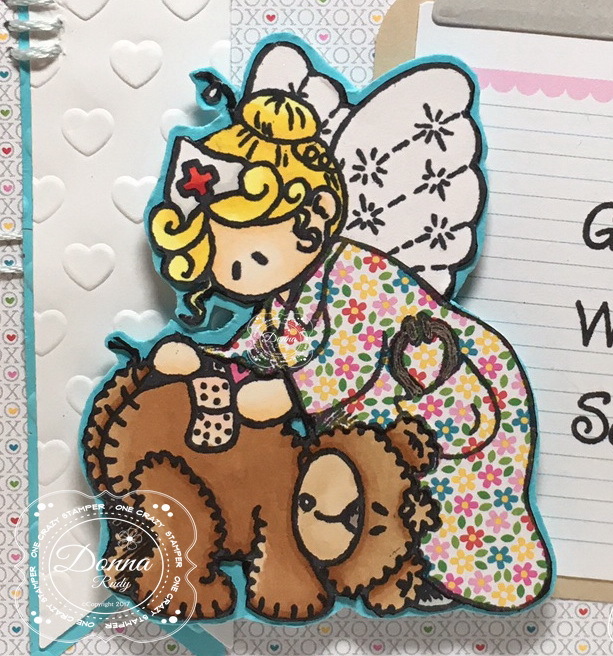 The sentiment was stamped in three separate words (it comes as on long sentiment) to a piece of patterned paper and added to a die cut clip board - a nurse would have a clip board to record things so I thought it fit perfectly with this image. I cut some matching card stock and ran it through a heart embossing folder to add some texture. And since she is repairing a bear who has come un-stitched I hand stitched some stitches on the card with embroidery floss to finish off my card. Eeeekkkkk! Love it! Valerie turned out perfectly and I love the paper pieced coat!! Your layout with the little clipboard is perfect and I love your hand stitching!! Another amazing card! !